After major weight loss or after bariatric surgery the inner and outer thigh sags. The thigh lift is a cosmetic surgery procedure designed to tighten the skin of the thigh and reduce sagging in the inner or outer thigh. This procedure is performed on its own, or in combination with other procedures such as a body lift. After major weight loss thigh skin will be loose and hanging. Patient with such excess loose skin is ideal patient for thigh lift. After liposuction of inner thighs, incision is put in groin region. 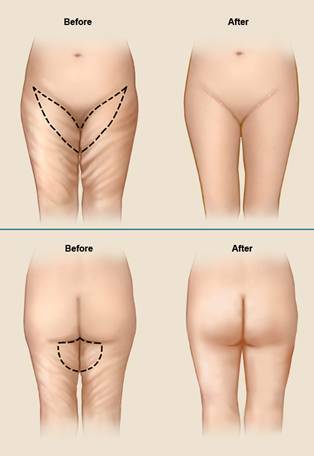 For Inner Thigh Lift, incisions are made in the inner groin crease. The thigh skin is lifted up, re draped and excess skin is trimmed away. Discomfort: Mild to moderate. Anticipate 2-5 days of prescription pain medication. Swelling : Improves over 14 days. Bruising : remains for about 3-5 days Bandages : Will be removed in 4-7 days. Stitches : to be removed after 10 days or absorbable Back to work : 5-7 days. Exercise : May be resumed in 2-3 weeks. Pressure garments : for 2-3 weeks to minimize swelling and assist in the natural shrinking of the skin, following Thigh Lift procedure. Will be seen after the scars have matured, which will be about six months.